Smoked fish is good in all kinds of recipes because of its deep flavor, plus it is nutritious, tasty and fairly cheap. A Smoked Mackerel Fishcake is this and more. Mackerel is not only an economical fish to cook and eat, as an oily fish it also very healthy. Most Mackerel is currently sustainable, so we don't need to feel too guilty eating it. 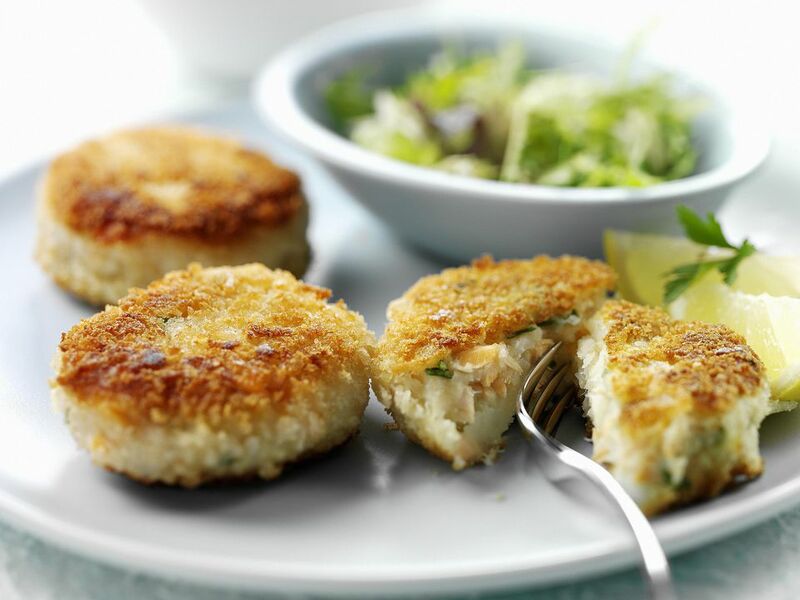 In this smoked mackerel fishcake recipe, the fish is teamed with hard boiled egg, horseradish cream sauce and parsley which delivers a soft , sweet and extremely tasty fishcake. Where possible, use boneless mackerel fillets to save you the time and trouble removing all the bones. Place the potatoes in a large saucepan, cover with cold water and add a pinch of salt. Bring to the boil and cook until tender. Drain, then mash and keep to one side. Cut the eggs in half, remove the yolks and cut the white into tiny dice. Place the yolks into a fine sieve and push through using the back of a spoon. In a large baking bowl, add the potato, sieved egg yolks, diced egg white, parsley, horseradish or horseradish cream and a pinch of salt and pepper. Stir well. Flake the mackerel into large chunks and add to the potato mixture, stir gently until all the ingredients are well mixed. Do not over mix or the fish will turn to a mush. Divide the fish mixture into 6. Roll each sixth into a ball, dip into the flour and roll until evenly coated. Dip the ball into the beaten egg, again roll to cover evenly, then again dip into the flour and repeat. Flatten the ball into a patty and keep to one side. Repeat with the remaining fishcake mixture. Heat a skillet large enough to hold 3 fishcakes. Pour in enough oil to cover the bottom of the skillet, ¼" deep. Heat until hot but not smoking. Add 3 fishcakes. Cook for 3 minutes, flip over and cook for another 3. Remove from the pan and drain on kitchen paper. Keep warm. Repeat with the remaining 3 fishcakes. Serve the fishcakes hot, garnished with lemon wedges on a bed of minted pea purée and a side salad or with fresh seasonal vegetables. The fishcakes can be served as a starter (one per person) or two per person as a main course.